AMAZING video captured the moment a groom’s friends made a dramatic entrance to his wedding party – by playing ceilidh music on top of a moving van. The musicians play the bagpipe and accordion full pelt as they balance on top of a white van making its way down a single track road. 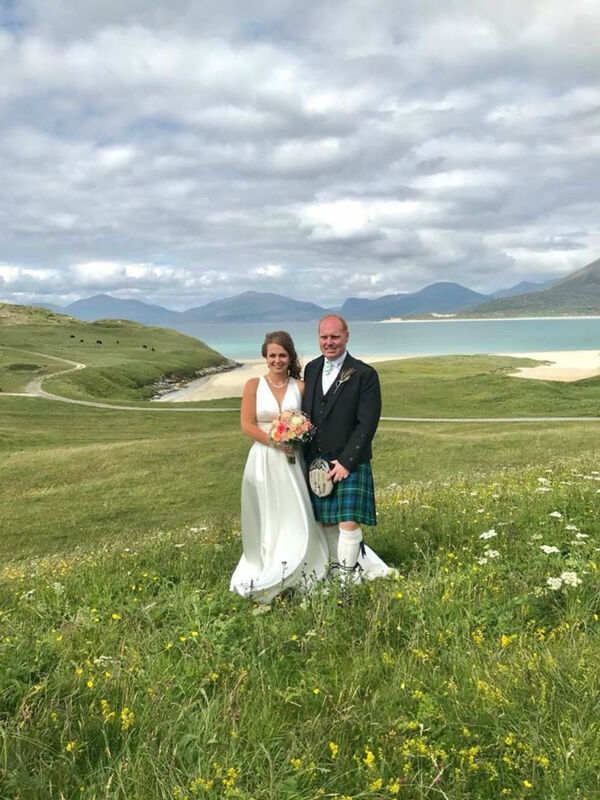 Angus John MacKenzie and bride Matilda, both 27, married in Leverburgh, Harris, on Friday. And, in true Hebridean style their friends Iain Angus Macleod, accordionist, and Angus John MacColl, bagpiper, were keen to make a dramatic entrance to the wedding party held in the groom’s barn. Wedding guest Donald Maclennan uploaded the clip to Facebook with the caption “Danns a rathaid”, which translates to “Road Dance”. The lobster fisherman’s footage has been shared over 1,900 times since it was uploaded on Friday and attracted dozens of comments. Donald filmed the clip from a car following the white van in convoy as they drive down a single track road. Bapgpiper Angus and accordionist Iain can be spotted standing on the top of the white van while playing traditional ceilidh music. The two musicians dance as they play and barely miss a beat as the van slowly crawls along the road and the barn can be seen in the background. And groom Angus John MacKenzie also filmed the musicians’ entrance as he stood outside the barn waiting for them to arrive. The groom and his guests can be heard laughing heartily as the pair bounce up and down while they play and the van pulls up to a stop. While Alexander Straker wrote: “Brilliant. OMG, you would definitely need to be stone cold sober to attempt that. Great playing by the way. Groom Angus said today: “This was two of my mates arriving at a wedding party we were having in my shed, it just happened that they brought with them some instruments! Donald Maclennan, who filmed the musician’s entrance, said: “We had a wedding party in Angus John’s barn on the Friday night. You can’t beat a Hebridean barn dance. “The musicians are friends of ours who were playing at the dance, and decided to make as grand an entrance to the barn as could be achieved, when travelling there in a combo van.